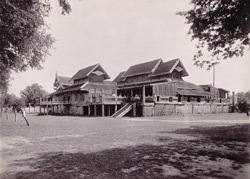 Photograph of the Kinwun Mingyi’s house at Mandalay in Burma (Myanmar), from the Archaeological Survey of India Collections: Burma Circle, 1903-07. The photograph was taken by an unknown photographer in 1903 under the direction of Taw Sein Ko, the Superintendent of the Archaeological Survey of Burma at the time. Mandalay, in Upper Burma, was the last capital of the Burmese kings, and was founded in 1857 by King Mindon Min (reigned 1853-78). The Kinwun Mingyi was the Burmese Prime Minister, a position last held under the Burmese monarchy by the Honorable U Gaung, Councillor of the Emperor and a Companion of the Star of India. This is a view of his private home, a wooden building raised on piles with a tiered roof, indicative of the high status of its occupant. It was situated near the Royal Palace at Mandalay, as the ministers of the King were required to live close by.